Reports from the lab: Water, water, everywhere! When it comes to space exploration, nothing makes the news quite like the possibility of finding extra-terrestrial water. Just over a month ago, a research team from Japan used the Subaru Telescope to observe the water-rich atmosphere of Gliese 1214 b, a planet 40 light years from Earth. Why are we always searching for water in space? What does discovering water have to do with the possibility of discovering extra-terrestrial life? 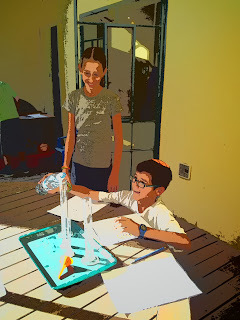 Water's molecular structure: We made models of water molecules, noting how oxygen and the 2 hydrogens share electrons. Water sticks to other water molecules and other stuff too: We observed the U-shaped water line in a graduated cylinder and the dome shaped water line, as you fill a cup just beyond the brim. Water is strangely denser than its solid form, ice. Water's a great solvent: We saw how water dissolves marker ink and carries along its components through filter paper. Finally we discussed why these properties are so important for life as we know it.